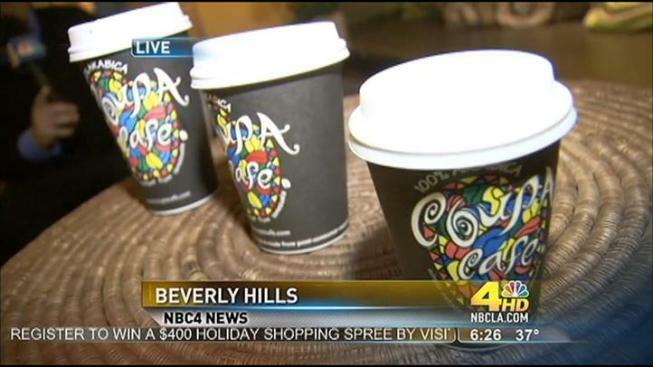 From the organic farms of Caracas to your morning kick-start cup of Joe, Coupa Cafe is a family-owned business that brings Venezuelan-style cuisine to the posh streets of Beverly Hills with savory and sweet arepas and hand-grown 100 percent Arabica coffee. Nancy and Jean Paul Coupal have been in the restaurant business for nearly 30 years and started it all with the opening of the first Coupa Cafe in Caracas, Venezuela. Following in their parent's footsteps, Camelia Coupal and her brother, Jean-Paul, opened up the first U.S. location in Palo Alto, followed by the Beverly Hills location, 419 N. Canon Drive, in 2006. "My mother decided to bring our Venezuelan delights and some of its culture to the [Los Angeles] area," said Camelia Coupal. The Venezuelan delights include their signature and exclusive organic coffee, roasted and packaged at the Arabica Coffee Company in Caracas supervised by Coupal's father. "Coupa Cafe is the only restaurant in the world outside Venezuela where you can enjoy the nation's shade-grown, organic, single-estate Arabica coffee beans," said Camelia Coupal. Besides a variety of coffee classics, the barista menu also includes Abuela hot chocolate with Venezuelan bittersweet chocolate and Spicy Maya hot chocolate with hints of chili and cayenne peppers. Breakfast dishes out a variety of Venezuelan specialties including a savory breakfast arepa, which is a gluten-free white cornmeal cake stuffed with fluffy scrambled eggs, crispy bacon and smoked Gouda. Another local favorite is the Criollo that is plated with scrambled eggs tossed with onions, tomatoes and mini sweet peppers, a plain arepa, grilled queso paisa imported from Venezuela, black beans and finished off with sweet fried plantains. The eye-popping Venezuelan restaurant features a heated outdoor-dining area with a tropical feel where sipping a marron latte and people-watching are recommended. The restaurant also includes a lounge with an indoor fireplace area perfect for the winter season. The restaurant is opened Sunday through Tuesday, 9 a.m. to 9 p.m. and Wednesday through Saturday 9 a.m. to 10 p.m. The restaurant also has a happy hour with specials on appetizers and drinks from 5 p.m. to 7 p.m. daily.